NATIVEN is automatic fractionation system of proteins or nucleic acids based on gel electrophoresis. In this system, automatic fractionation is accomplished by repeat-ing the following processes, electrophoresis, recovery of separated proteins or nucleic acids by air pumping system, and re-filling of recovery solution. The eluted proteins or nucleic acids in the collection part are collected by air pumping system and fractionated into fraction collector. By introducing air pumping system eliminate the necessity of ex-cess buffer to collect samples, and minimize dilution and contamination. 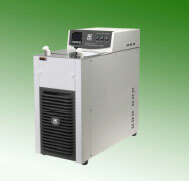 Digital Temperature Controlled cooling Circulator. Flow rate: Up to 3 L/min.